Instructions for using Plasma, a portal application designed to simplify posting content to Engineering IT managed digital signs. The application can be found on the My.Engr Portal here, or by appending /digitalsigns/ to a department portal URL. Plasma is a portal application designed to simplify posting content to Engineering IT managed digital signs. The application can be found on the My.Engr Portal here, or by appending /digitalsigns/ to a department portal URL. Select Show - The Plasma app only displays one slide show at a time. Use this drop-down menu to select the slide show to view. 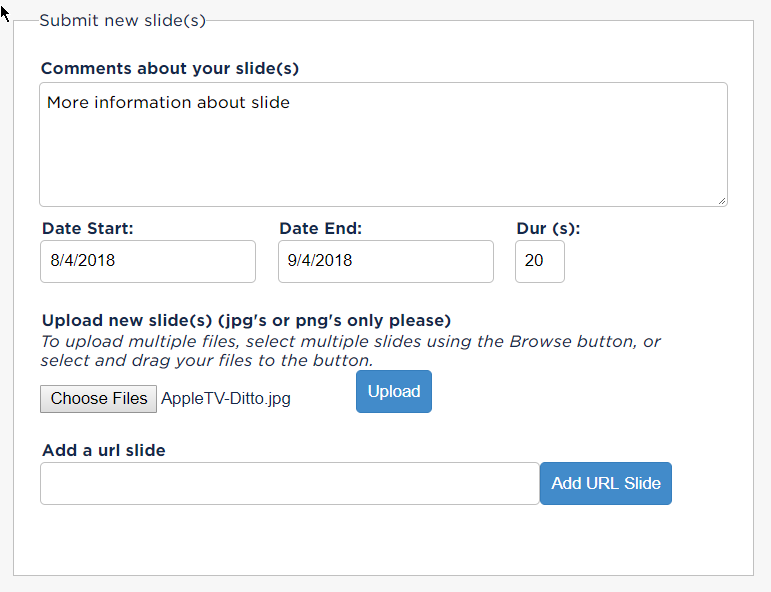 Slide Order - This field selects the slide order option for the selected show. Sequential - This options plays through the slide show in the seqence shown in the Current Slide Set queue. Random - This option plays through the slide show randomly shuffling the slide order. 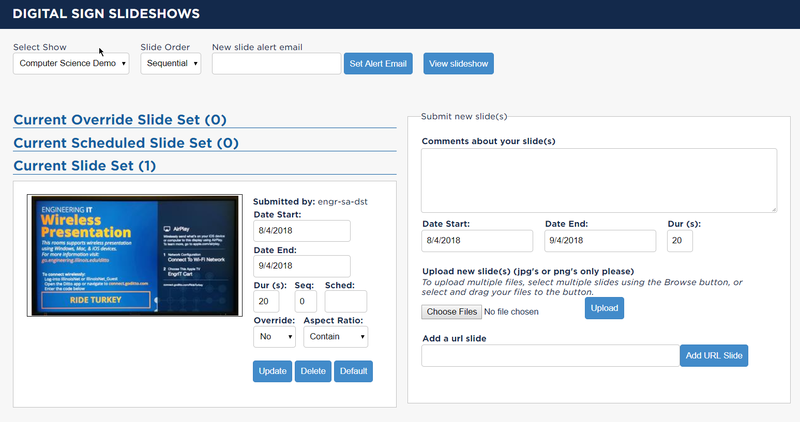 New slide alert email - This field allows an email address to be set to recieve alerts when new slides are uploaded. This allows Plasma managers to know when there are new slides awaiting approval. 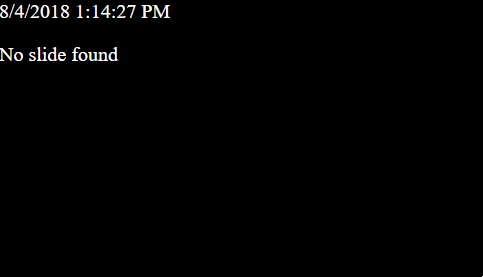 Current Override Slide Set - This queue includes currently playing override slides. If slides appear in this queue, no slides from the current slide queue or current scheduled slide queue will be played. Current Scheduled Slide Set - This queue includes currently playing slides with a schedule. These slides will only play at the number(s) of minutes after the hour displayed in their Seq field. Current Slide Set - This queue includes all currently playing slides that are not set as override slides or have set schedules. New Slides - This queue shows all slides that have been uploaded, but not yet approved. Default Slide - This queue only displays if a default slide has been selected. This queue will only contain one slide. Submitted by - This field displays the netID of the slider uploader. Date Start/Date End - These fields show the slide display start and end date-times. These should be formatted MM/DD/YYYY, MM/DD/YYYY hh:mm:ss (24hr clock), or MM/DD/YYYY hh:mm:ss XM (12hr clock). Dur (s) - This is the duration for which the slide will display in seconds. This field does not accept mm:ss notation. Ex. one minute and thiry seconds must be written as 90 and not 1:30. Seq - This field allows slide sequences to be reordered. Default is 0. Slides will play in ascending, numeric order when the slide order is set to Sequential. Sched - This field allows slides to be scheduled to play at X number of minutes after the hour. Ex. enter "15" into the Sched field to play that slide at 15 minutes after every hour. This field also takes multiple values seperated by commas. Ex. enter "15,30,45" into the Sched field to play that slide at 15, 30, and 45 minutes after every hour. Override - This field determines if a slide is an override slide. Default is "No". If a slide is set to override, only slides marked as override will be displayed between those slides start and end dates. Aspect Ratio - This field determines the displayed aspect ratio of the slides. This is effected by the aspect ratio of the content display area on the digital sign. Most content area aspect ratios are 16:9. Stretch - This option stretches the image to fit the aspect ratio of the content area. Comments about your slide - use this this text area to make notes to other Plasma managers or to communicate with departmental slide approvers. 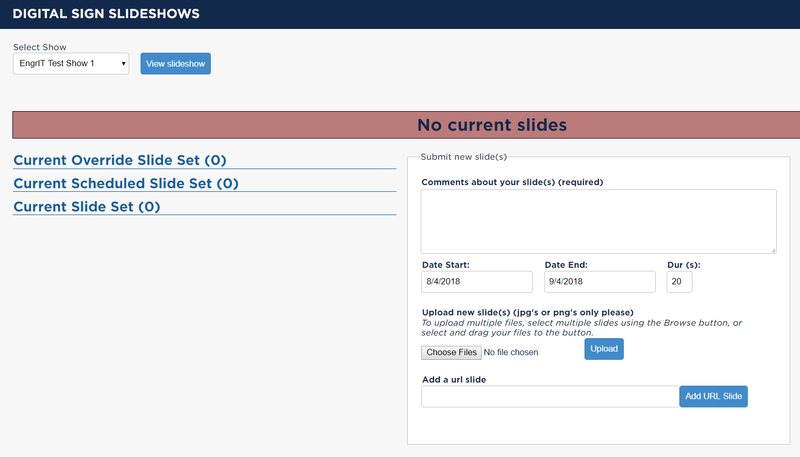 To submit your slide or URL you will need to click the respective Upload or Add URL Slide buttons. 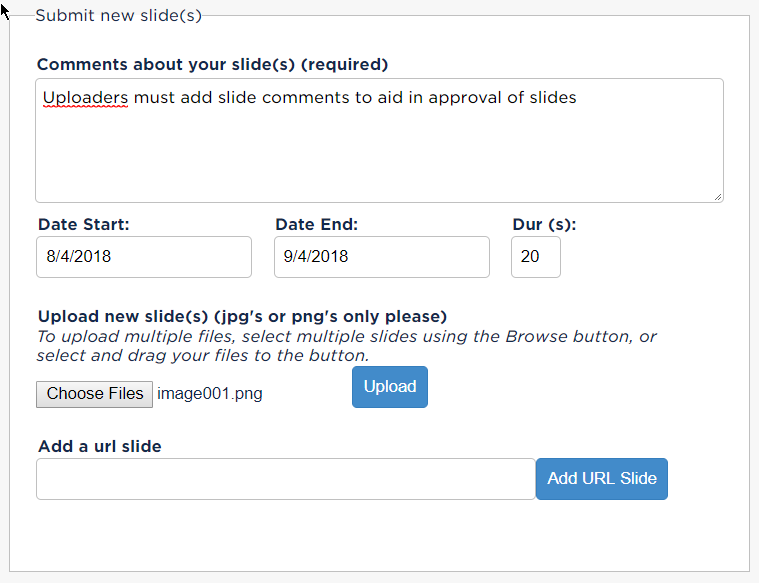 Once a slide is in the New Slides queue the slide metadata can be edited. This allows the slide parameters to be changed before it goes live. Once the proper metadata has been set, click approve and the slide will move to the corresponding queue. After a slide has been approved and moved out of the new slide queue, its metadata can still be changed. To edit a slide's metadata, make any updates to the metadata to the slide and click that slide's Update button. Note: Only one slide may be edited at a time. If multiple slides are edited, only the slide where the Update button was clicked will be updated. 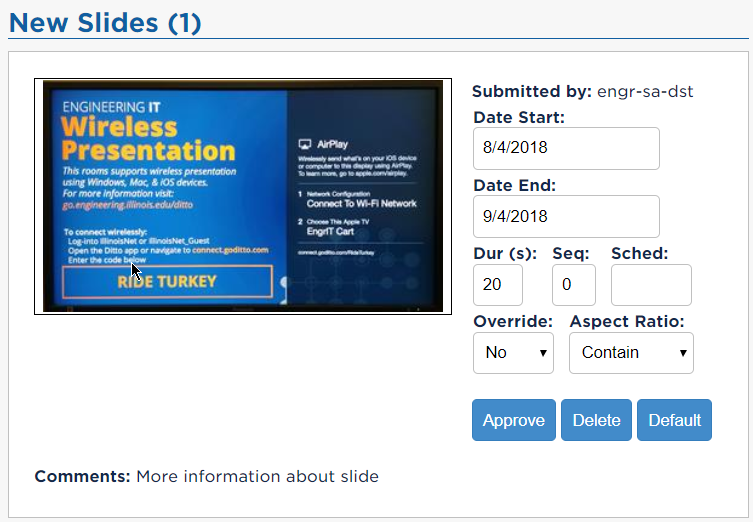 In the case that there is no content in a slide show's active queues, a black "No slide found" page will be displayed to the signs. This tends to make signs look "broken", and we have provided the ability to set a slide that will take the place of this screen. You may set any slide present in any queue as the show's default slide by clicking its Default button. You may remove your default slide by clicking Remove Default in the Default Slide queue. The Add a url slide field allows web content to be included in Digital Signs slide shows. 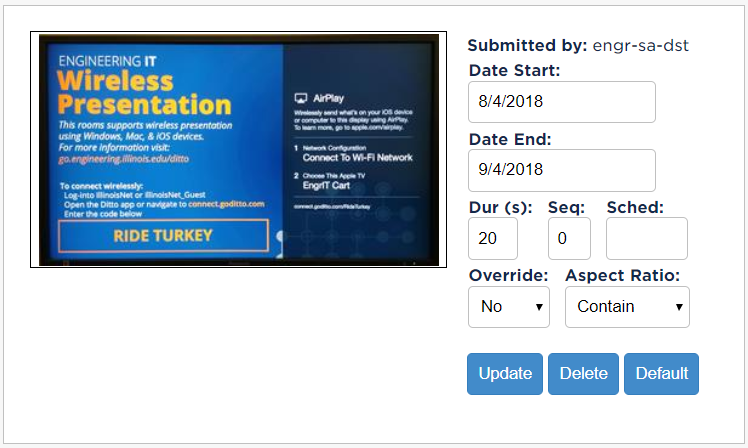 Utilizing Google APIs on the back-end of the Digital Signs Portal Application allows play and timing control of YouTube videos. Find the YouTube Share URL. Optional - In the sharing pane, check the Start at box and enter a time in minutes and seconds for the video to start. Adjust the metadata and approve the video. Note: Only the URL will be shown on the Plasma portal page. Content will be properly displayed on the slides. For YouTube videos, the Dur (s) is still used and the duration must be set for the length of video to be played. Ex. To play a 1:30 video all the way through, the duration must be set to 90. Advanced Ex. 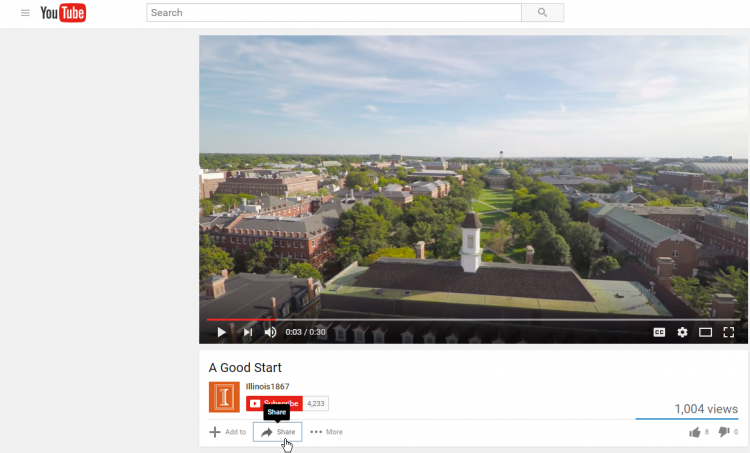 To play 30 seconds from the middle of a YouTube video, add the start time to the URL from the YouTube share pane (i.e. Start at: 1:45) and add the desired duration in the Plasma app (i.e. 30). This will play from 1:45 to 2:15 in the selected video. Find the URL of the Media Space video and copy it. For Media Space videos, the Dur (s) is still used and the duration must be set for the length of video to be played.